These unique 2 piece outfits are perfect for your little girl's Halloween wardrobe. 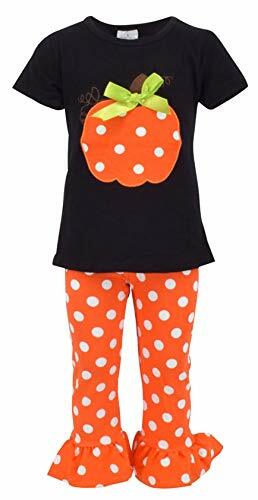 This set includes orange polka dot leggings with a matching shirt that has a pumpkin design. Made of a 97% high quality soft cotton and 3% stretchy spandex blend this outfit is soft and comfortable. WHAT KIDS [LOVE]: Comfort and pumpkins! The cute polka dot and pumpkin design will make this outfit your little girl's favorite! FIT AND [FEEL]: 97% soft cotton and 3% stretchy spandex; fabric is breathable and flexible. You won't get any fuss about putting this one on! STYLE [PUMPKINS]: A cute orange pumpkin with polka dots make this a perfect fall outfit for your little one. The perfect addition to your little girl's fall wardrobe. GIFT[ABILITY]: Makes a perfect halloween or "just because" gift for your very own little love.